One of bluetooth module which is able to handle bluetooth communication is HC-05. This module is widely used because it is relatively easy to find on the market and the price is fairly cheap. By using this module, you can deal with all Bluetooth-enable devices. But, remember, the HC-05 module only supports Bluetooth serial protocol (SPP = Serial Profile Protocol). It can’t support other services such as Bluetooth-audio, file transfer, OBEX or recently technology, BLE (Bluetooth Low Energy). The last one is a new technology in bluetooth which need low power so it’s widely used in portable devices such as smartphone, EDC or others. The HC-05 is powered by 5V DC voltage, so you must connect it to pin Vcc Arduino. It drains current 25-40 mA in peak usage (active communication) while just drains 8 mA approximately in standby condition. So, please be aware if your circuit uses a lot of active component, you must recalculate your power source. Notice there are at least 4 pinout is used for interfacing with an Arduino Bluetooth module HC-05, ie, Vcc, Gnd, TxD and RxD. In principle, this module communicates using serial protocols at TTL level that can be directly with Arduino (not RS-232 voltage level). In sketch example I gave, I use digital pins 8 and 9 are emulated as a serial port using SoftSerial.h built-in library. Why not use serial port hardware on pins 0 and 1? 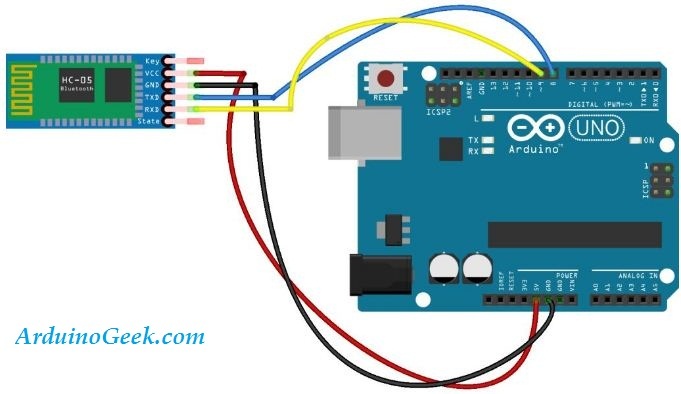 Actually you can also use these pins, but you will not be able to monitor serial data stream over your computer (using Serial Monitor tools) when Arduino serial port is already used to communicate with a Bluetooth module. So if you use pins 8 and 9 as a serial port, you can debug serial data exchange through Serial Monitor window (Tools-Serial Monitor menu in Arduino IDE). Line : initializes the default serial port (pin 0 and 1) with 9600 bps baudrate. This serial port will be used to debug/monitor data exchange via Serial Monitor window.